As one of the area’s most carefree and nonchalant taverns, Madison’s Harmony Bar on Atwood Avenue has been delighting local residents with music, food, and drinks for the past two decades. Twenty years in business makes it one of the city’s longest-lasting live music venues in an industry that usually chews up clubs and spits them out. To celebrate the launch of their third decade, owner Keith Daniels is sponsoring an all-day anniversary party on March 14th at The Barrymore Theatre right down the road. And the rationale behind it is simple. “I wanted to throw a party.”, Daniels says. “I wanted to throw a good party for all the good people that have been coming for twenty years. We’re having Bunky’s (a cafe also on Atwood and another near-east side of Madison tradition) do the catering because I want all our people to have the day off. And I still thought that we should do a little something for the neighborhood. So, we decided to put a five dollar cover on it and it all goes to the Goodman Community Center.” So, it’s not only a party but a benefit for one of the area’s most valuable programs for at-risk youth as well. The Harmony has music nearly every weekend and Daniels remembers his favorite show. “Paul Black and The Flip Kings in November of 2005, because that was inspiration for me and another guy named Keith to produce a record for him called Live At The Harmony.” Some of his other favorites are The Bel-Airs (playing the 20th anniversary show this month) as well as pianist Marcia Ball. 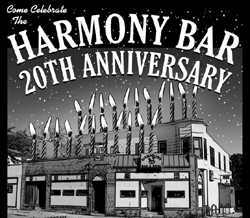 Daniels describes his bar’s niche as a place ”...for people who aren’t pretentious and just looking to have a good time… We have a real relaxed style.“ People can experience a little bit of that style at The Harmony’s Twentieth Anniversary Party. Featured acts include Chicago’s Cash Box Kings, the aforementioned Bel-Airs from Missouri as well as Madison favorites like The Jimmys, The Jim Schwall Band, The Midwesterners, and the Westside Andy/Mel Ford Band. The party starts at 1pm and goes until 10pm.